Chilita fasciculata (Britton & Rose non Engelm.) Buxb. W. Amer. Sci. 12: 161. 1902 et: Seed Pl. Co. Cat. Cact. 1903, 21. 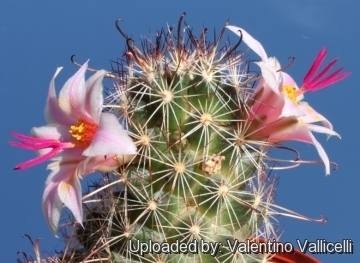 Habitat: Sonoran desert scrub, valley floors, silty or sandy soils; 10-600 m. . It will grow only where it is shaded from the full sun. 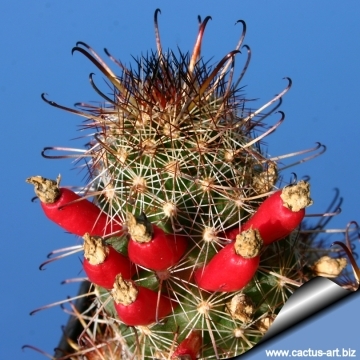 This can be under shrubs and frequently at the base of Opuntias, where the germinating seeds find added protection provided by the numerous fallen opuntia joints. Ebnerella fasciculata (Britton & Rose non Engelm.) Buxb. Mammillaria fasciculata Britton & Rose non Engelm. Neomammillaria fasciculata Britton & Rose non Engelm. Mammillaria thornberi var. yaquensis (R.T.Craig) Neutel. 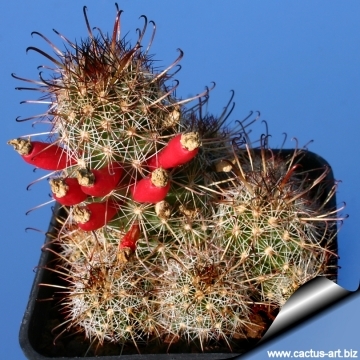 Description: It is a small cactus with slender stems, that likes to cluster from the base, forming nice clumps or families. The particularity of this species is that every branch will form an independent root system, the connections of which to the rest of clone are ephemeral, resulting in dense clumps of independently rooted stems. Stems: Slender, cylindrical, often dull purplish green, 4.5-10 cm tall (but sometime 30 cm high), 2-3.5 cm in diameter, tapered at base, firm, lateral joints easily detached from the body. 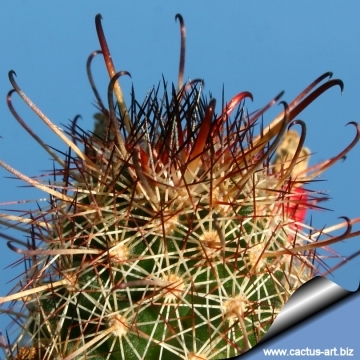 Spines: Whitish to yellowish near base, pale reddish brown to nearly black toward tips, glabrous; They do not hide the surface of the stem completely. Radial spines: (13-)15-20(-22) per areole, whitish, with reduced dark tips relative to central spines, bristlelike, 5-9 mm long, stiff. Central spines: Small, fish-hooked, usually 1 (or sometime 2 or 3) per areole, porrect, often more elongated, darker, 9-18 mm long. Subcentral spines: 0(-3) per areole, adaxial to central spines, more or less transitional to radial spines. Flowers: Broadly funnel-form, light pink on the outside and a deeper lavender pink in the center, with a white star shape appearance from a distance, due to the contrast of colors, 1.5-3 long and 1-2.5 cm large. The outermost tepal margins are densely short-fringed. Fruits: Prominent, bright red, obovoid to nearly clavate, 7-15 × 4-7 mm, juicy only in fruit walls; floral remnants persistent. Fruiting in Oct-Nov, Feb-Mar. Seeds: Black, 0.9-1.1 × 0.8-1.1 × 0.7 mm, pitted. 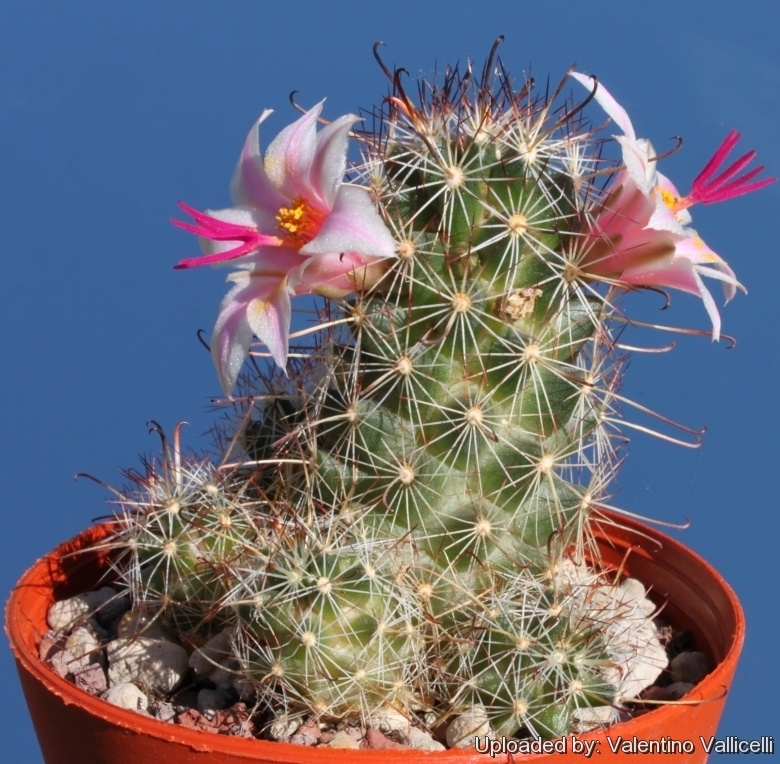 Mammillaria thornberi Orcutt: (subsp. thornberi) has thicker stems, 2,5 cm wide and tapered at the base, with 15-20 radial spines. The radial spines are not distinctly pubescent. Distribution: Arizona and Sonora. Mammillaria thornberi subs. yaquensis (R.T.Craig) D.R.Hunt: has more fragile stems at 1,5 cm thick and 7 cm long, with 18-19 minute, soft, and hairy radial spines. It is endemic to Sonora. 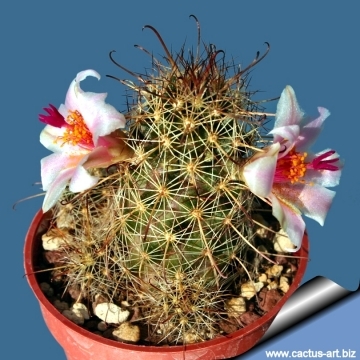 Cultivation and Propagation: This plant blooms easily and needs lots of light. 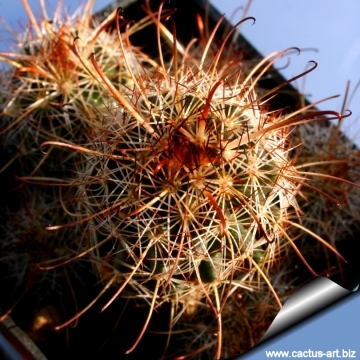 Use a pot with good drainage and a very porous mineral-based potting mix. Potted plants are quite wet-sensitive, especially in light of its small root system. Water sparingly during the growing season, letting soil dry in between to prevent root rot. Keep very dry in winter. Feed with a high potassium fertilizer in summer. Usually it is recommended to overwinter this plant in a bright and warm greenhouse at at least 8-10° C , but it has proved to be quite frost resistant (if kept dry, it is hardy as low as -7° C). A resting period in winter and strong light are necessary so that it can flower properly. Plants will offset readily, and dense clumps can be produced in a very few years.